Customers throng the Walton pavilion at Dhaka International Trade Fair in the capital on Tuesday. 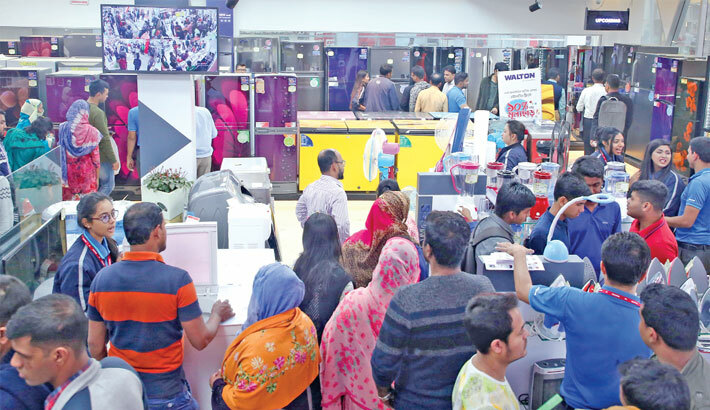 Customers are enjoying maximum 100 percent cash discounts, cash vouchers up to Tk 1 lakh and various sorts of free products on the purchase of wide ranges of electronics, electricals, home and kitchen appliances at Walton pavilion in the ongoing Dhaka International Trade Fair. At Walton Pavilion, the local brand is offering 10 to 12 percent cash discounts on its all models of refrigerators. Customers of LED and Smart televisions are getting 12 percent and 15 percent cash discounts respectively. A flat15 percent discounts are offered to the air conditioners’ customers, said a press release. In addition, 10 percent discounts are enjoyed by the customers of generators in the fair. The buyers of home appliances at Walton Pavilion are getting 5 to 10 percent discounts. Smart phone lovers are enjoying attractive cash discounts, ranging from 5 to 100 percent, at Walton Pavilion in the DITF. Already, A customer from the Capital’s Mirpur area named Md Sabbir Hossain Maruf got 100 percent discount through purchasing Walton Primo H7 series smart phone at Tk 9,999. Many other buyers received attractive amount of cash discounts. Walton Pavilion Coordinator Mohammad Mostafazzaman said, they are displaying and selling out nearly 100 sorts of electronics, electrical, home, kitchen, industrial solutions and ICT products and accessories in the pavilion. Of the 100 sorts of appliances, around 1000 models are available at Walton Pavilion that were turned into customers’ prime attraction at the fair.